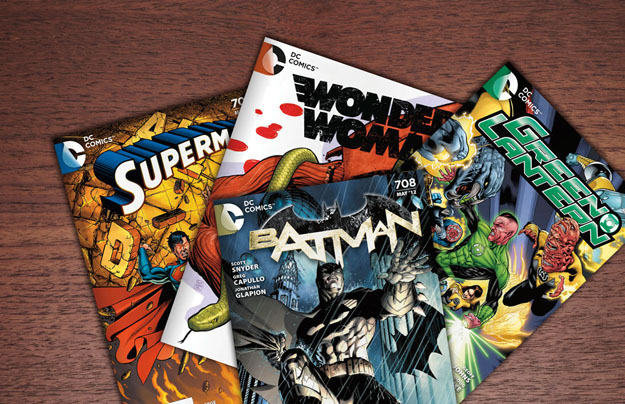 Is DC Comics Going Back To Old Numbering? DC Entertainment unveiled their new brand strategy and logo, and lo and behold some of their imagery looks to possibly clue us in to the fact that the whole New 52 angle on some of their pre-existing titles just might revert to the old triple digit numbering. Granted, there is no official mention of this, but the fact that they released an image of "Batman" with the number 708 on it, even though it is the Greg Capullo and Scott Snyder run, and not the David Hine run from last year that actually had the number 708 on it, makes it seem like they are preparing to be ready for such a numbering. Take a look after the jump to see the full sized image and the numbering that comes along with it. By the way, I'm not a fan of the new DC logo. What do you think about it?